John Lackey had allowed just one run through five innings. Then his wild throw on a potential inning-ending double play grounder started the Minnesota Twins to a 5-3 win over Boston on Thursday night. 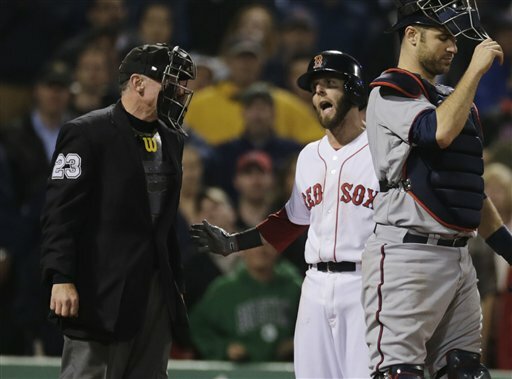 BOSTON (AP) — John Lackey looked sharp throwing to home plate. Tossing to second base was his downfall. The Red Sox starter had allowed just one run through five innings. Then his wild throw on a potential inning-ending double play grounder started the Minnesota Twins to a 5-3 win over Boston on Thursday night. The Twins scored four unearned runs in the sixth after Lackey fielded Trevor Plouffe’s grounder and fired it past the outstretched glove of second baseman Dustin Pedroia into center field. The Red Sox lost their third straight and sixth in their last seven and dropped out of first place in the AL East for the first time this season. They’re percentage points behind the New York Yankees and tied with the Baltimore Orioles for second. The Twins went into the sixth trailing 2-1 and, with the help of Oswaldo Arcia’s two-run homer, came out of it with a 5-2 lead. They finished their road trip at 5-5 and moved 2 1-2 games out of first place in the AL Central. Kevin Correia (4-2) pitched 5 1-3 innings, his second shortest outing in seven starts this season. Then Brian Duensing got out of a sixth-inning jam and Gardenhire kept him in for the seventh. He finished with 1 2-3 hitless innings. Jared Burton struck out the side in the eighth and Glen Perkins struck out two more in the ninth and got his eighth save in eight chances. Lackey (1-3) pitched well until his error, then came back to pitch a perfect seventh before Koji Uehara took over in the eighth. Lackey allowed six hits and one walk and struck out eight. The Red Sox finished with 11 strikeouts, the 21st time in 35 games they’ve had at least 10. Boston threatened with one out in the eighth when Daniel Nava walked and Will Middlebrooks reached first when shortstop Eduardo Escobar bobbled his grounder. It was the Twins’ first error in 12 games. But Burton struck out Stephen Drew and Mike Carp. Trailing 2-1, the Twins went ahead to stay in the sixth. Joe Mauer led off with a single and took second on a one-out walk to Justin Morneau before Lackey flubbed his chance to get out of trouble. Mauer scored on the error, tying the game. Ryan Doumit’s sacrifice fly gave Minnesota the lead and Arcia hit the next pitch for his third homer of the season. “The errant throw opened the door for them,” Boston manager John Farrell said. The Red Sox had taken a 2-0 lead on RBI singles by Pedroia in the third and Drew in the fourth. The Twins scored a run in the fifth when Arcia tripled and scored on a double by Aaron Hicks. After falling behind 5-2, Boston scored in the sixth on a leadoff double by Mike Napoli and a run-scoring single by Nava. Middlebrooks then grounded into a forceout. Duensing replaced Correia and retired the next two batters. That was one of many wasted opportunities for Boston, which left exactly one runner on base in each of the first seven innings, two in the eighth and one in the ninth. NOTES: Twins SS Pedro Florimon was listed as day to day after leaving the game in the bottom of the seventh with a tight right hamstring. … The Red Sox transferred closer Joel Hanrahan from the 15- to the 60-day disabled list. He is scheduled to see orthopedist James Andrews on Friday, an examination that could determine if he needs surgery after suffering a strained right forearm. … Boston opens a three-game series at home with the Toronto Blue Jays on Friday night with Jon Lester (4-0) pitching for the Red Sox against Ramon Ortiz (0-0). … Minnesota starts a nine-game homestand Friday with Mike Pelfrey (3-3) pitching for the Twins against Jason Hammel (5-1) of the Orioles.